Fiona Bunn is supported by SportsAid in partnership with the GLL Sport Foundation for Orienteering. 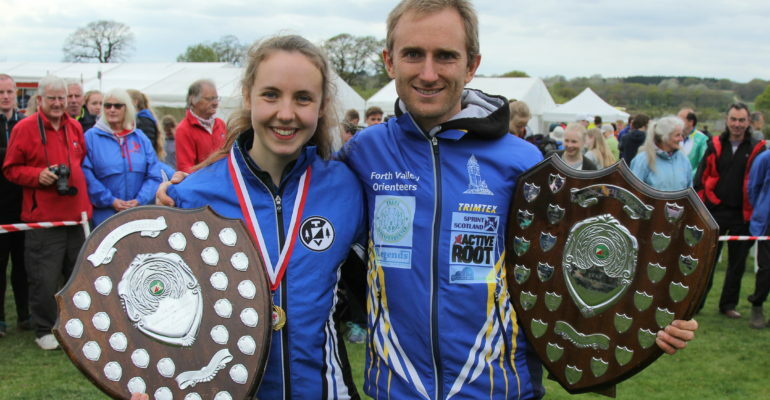 Fiona is having a fantastic season to date, having won 5 out of 6 selection races for the Junior World Orienteering Championships, (the last selection race is going to be the British Long distance championships in 2 weeks time), so it is looking good for selection at the moment. At the last selection weekend (JK international Orienteering festival) on the Easter weekend there were 3 races over 3 days: Sprint, followed by middle distance followed by a Long distance – a tough stint! Fiona was awarded the Overall Best female performance out of any age category which was a real honour and something we are very proud of. Above is a photo of Fiona with the winner of the men’s award (Photo credit Rob Lines). Fiona was also part of the winning England team in the annual Interland competition in Belgium at the beginning of April, where she was surprised to win the senior womens race in hilly terrain. A good introduction to Senior level racing! Fiona has also been training recently in Sweden with an elite group from Sodertalje Nykvarn Orienteering club, for whom she will be running for in the annual Tiomila relays this weekend (a massive international relay held in Sweden: 5 legs for the women and 10 legs for the men). Hopefully it will be a good experience and Fiona will be able to return there regularly as she gained a lot of experience from her last trip. We look forward to following Fiona this season and hope she continues the fantastic results so far!